6 2/3 innings was the distance gone by senior ace Hunter Mattheessen against Gulliver Prep on Saturday night at the Rex. 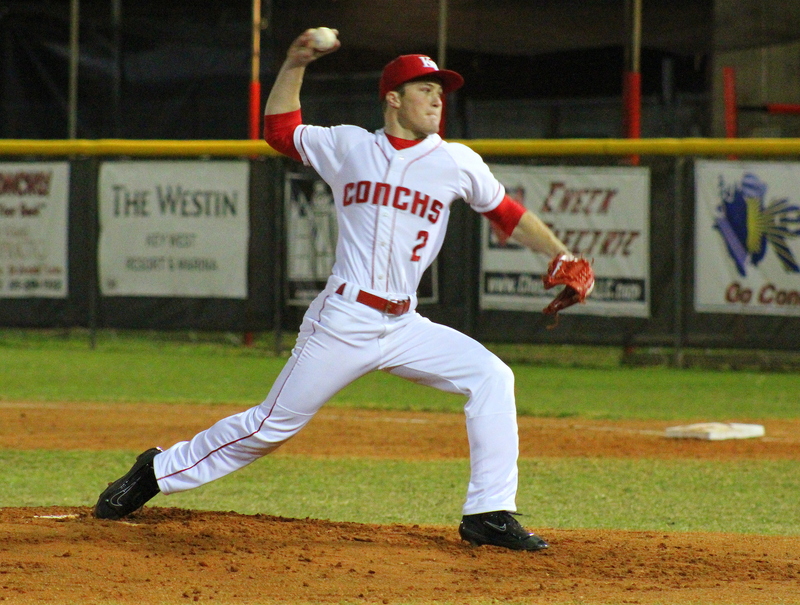 Mattheessen had one of his strongest outings after getting the nod to start from Conch head coach Ralph Henriquez last week. The senior finished the night with four strike outs, only allowing five hits. 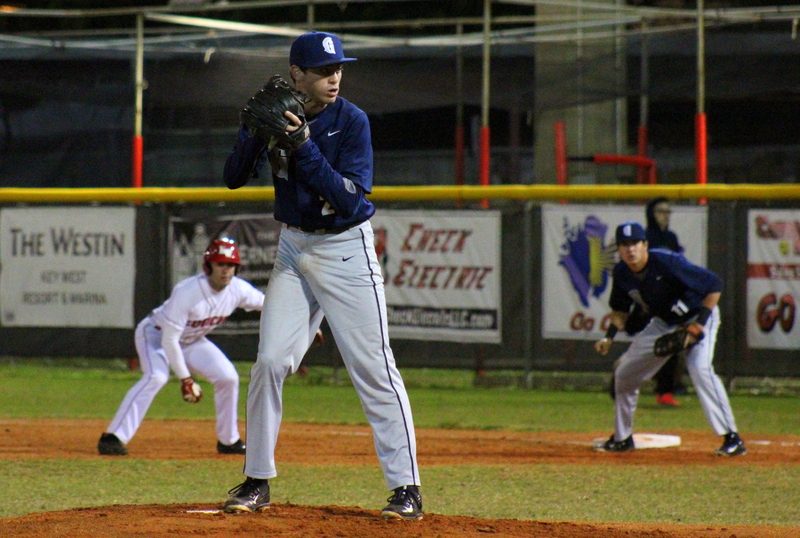 Despite the impressive night from Mattheessen, the Raiders pitching rotation was too strong for Key West as Gulliver Prep finished on top winning 2-0. A solo home run in the top of first and an RBI single in the 3rd was enough for the Raiders to travel back up north with their 6th victory of the season. The night started out energetic as the folks from Outback Steakhouse were serving the food for the first District 16-5A meeting between Gulliver Prep and Key West. Walking on the mound with great confidence and high nerves, Mattheessen struck out his first two batters he faced. 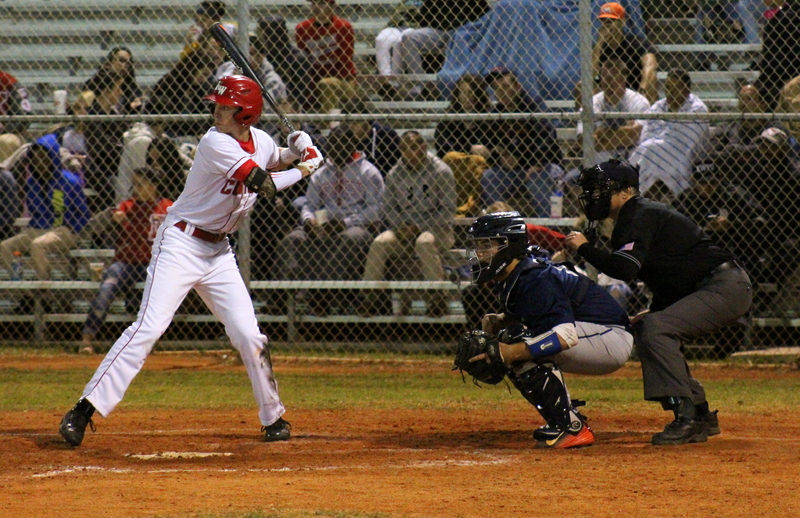 The third batter, FIU commit Javy Valdes, silenced the fans at Rex Weech with a deep shot to left field. The second the ball hit the bat, it was gone and as the ball flew over the fence, the Raiders were up 1-0 after the first inning. Pitching for the Raiders was junior UM commit Robert Touron. The Cane commit showed off his talent pitching five innings, striking out eight Conchs and only allowing two hits. In the top of the third, Touron got help from his offense with a second insurance run brought in. The first Raider batter sent one flying to right field good enough for a stand up double. With runners on corners, after a second straight hit, an infield single came off the bat too quickly for the Key West short stop bringing in the second run of the night for Gulliver. An athletic catch past second base by Randy Garcia ended the inning keeping the Raiders from scoring more, up two after three innings. Throughout the game, Key West had a hit here and there, but not enough of a threat to score until the bottom of the fifth. Patrick Spencer reached first base after an error made by the Prep second baseman then Garcia was walked. Two outs and runners on first and second, Key West was looking to chip away at the two run deficit. Touron escaped the inning after Hunter Sellers grounded out to first base and Gulliver Prep still led 2-0. Still on the mound, Mattheessen threw an efficient 6th inning pitching five balls facing only three batters. The senior was pulled in the top of the 7th after allowing his 5th hit of the game and walking the next batter. Damon Taylor came in relief and left it up to the Conch offense to win the game. Making his third and final pitching change, Gulliver Prep head coach Manny Crespo Jr. sent out Valdes to the mound to finish the night. After hitting a home run in the first inning, Valdes struck out the first batter he faced and kept Key West from scoring earning the save and the 2-0 win for Gulliver Prep (6-2 overall, 2-0 District 16). 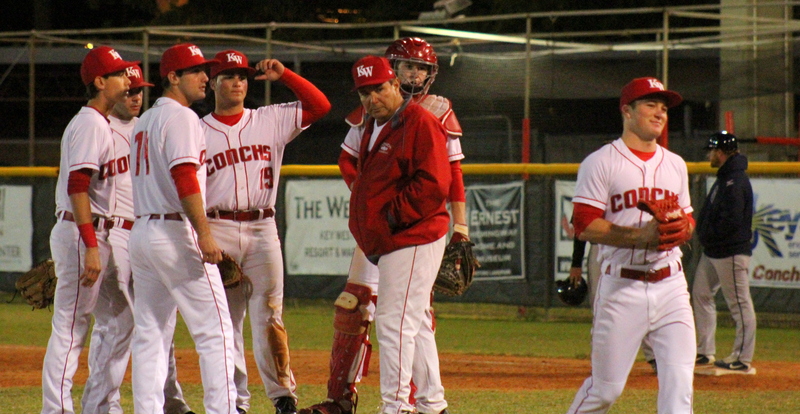 The loss is Key West’s second straight after losing 6-5 on the road Friday night to Southridge. Key West will have a second shot at Gulliver Prep, this time in Miami on March 30th. A loss is a loss, but considering that Keys Gate Charter, the only other team in District 16, lost 13-1 against Gulliver Prep on February 24th, losing by two runs is a statement-making-loss for a young Key West team. The Conchs (4-2 overall, 0-1 District 16) host Cypress Bay next week in a two game series at the Rex, then travel to Keys Gate on March 8th. This entry was posted in Key West HS Baseball.